Many music lovers currently using entry level/computer based digital file music systems would like to experience better quality sound yet there has been a gap in the market place for an easy to use Hi-Fi audio component. The Melco design team has addressed this need with a range of high resolution music server products that do not require specialist knowledge to install, configure or use. Designed from the ground up, high resolution streaming to a network player and/or USB DAC can now be done in a way significantly exceeding the performance possible from an optimally configured Laptop, PC based server, or indeed standard module computer boards found in other streaming products. Custom audio servers can be built from scratch but they hit a performance ceiling as there are limits to what can be done with a general purpose PC/Laptop at the software and hardware level. General purpose operating systems fundamentally connect to the Internet with a protocol operating across several ports so multiple tasks, read/send emails, opening several browser windows etc, can all be handled by a polling process. The only task a dedicated audio product needs to do is to stream audio data without compromise. General purpose computer operating systems control the priority of the polled tasks but because audio processing is never the highest priority, it is constantly interrupted with other higher priority tasks resulting in data corruptions and timing errors creating jitter in the audio samples. Internal USB data transfer may not be bit perfect in PCs unless the drivers are well designed and robust. Writing to and reading from disk drives is optimized for access speed, and not audio sampling precision. And the whole computer environment is noisy from closely packed circuits operating at high frequencies with lots of processes kicking in and out. For networking, there is also the ability and quality of the router and switch to consider. Those provided by Internet Service Providers, or sold in stores, are again designed for multi-functionality and speed rather than being solely concerned with the sampling precision of streaming audio. Conventional network players that plug into a router directly receive all the network traffic and noise from the router. The Melco sits between the router and the player. Inside the Melco N1A, N1ZH and other models, a powerful dedicated processor manages the data packets (re-order, deal with missing or duplicated packets etc,) creates the audio samples, and strips away all unwanted network traffic such as TV DLNA, gaming, shopping and application notifications so only pure audio and control data is sent to the player via the dedicated player Ethernet port. 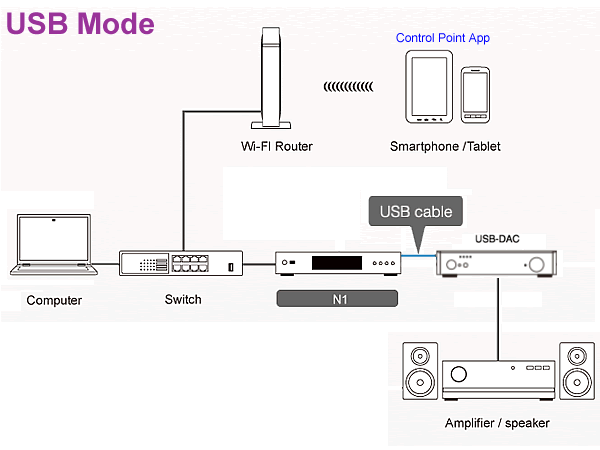 In "direct mode", the Melco is completely off the network and generates it's own IP address for the network player. No noise is passed on to the player or therefore the rest of the audio system. Melco uses a RISC type processor to manage the digital data with simple instructions executing in one clock cycle on one "pipe". This means the data is preserved in a single stream as it would be being read from a CD. This is a big advantage in terms of maintaining audio data timing precision over CISC processors (INTEL) whose complex instructions require various numbers of clock cycles and which use multi-threading across several "pipes". Futhermore the complexity of CISC processors creates higher levels of electrical noise and proximity interference that is very hard to completely remove using isolating capacitors on the board that may simply dump the noise somewhere else for it to be a problem. The Melco N1A and N1ZH use a sophisticated fully grounded internal Power Supply Units; one for internal, and one for external comms. In the N1Z these are medical grade. The twin supplies are far superior to wall warts and the internal supplies used in most other streamers. Furthermore most wall warts use basic switched mode power supplies, and unlike the high quality ones used audio amplifiers, these generate their own noise and contaminate the mains supply feeding the other components in the Hi-Fi system. Laptops and NAS drives that use a wall wart or internal batteries have a floating ground. Without a physical ground, circulating ground currents within the USB environment add noise to the system. Wall warts and 2-wire inline supplies have no grounding for interference rejection. The focus is on precision of the audio sample data rather than speed. The Melco N1A and N1ZH use a USB-like internal bus architecture that always keeps the data under rigorous clock control, something which is never the case in the computer environment. With this proprietary bus architecture in place, incorporating backup and expansion USB 3 ports, plus two additional USB ports, is now straight forward. Functionality is controlled via front panel controls and the display prompts making it easy to backup data or transfer files from USB thumb drives (that can also be directly read.) With Melco, data is precision clocked all the way to the USB audio connectors which become true high fidelity interfaces. Melco uses specially optimised version of Twonky. Memory allocation management in standard UPnP servers is not designed for high quality audio especially with very large audio files. Melco is supported by a range of precision engineered data cables to reduce rise time and prevent cable induced jitter. In essence PC or MAC based systems will play a tune but are prevented from true high resolution audio because they are crippled from the start by inferior power supplies generating noise, and bad data timing from poor pulse edges and reflections on the data bus. They have no concept of low jitter because for regular data processing it is irrelevant. Melco replaces IT industry NAS based streaming systems and replaces PC and music player software for direct USB connection to a DAC. Overall by using dedicated hardware design and customized data management, the Melco N1A and N1ZH, minimize the errors, noise, and jitter that degrades sound performance, while the dedicated server software and simple user interface make the product easy to use. The preinstalled media server arranges your music by artist/album/folder etc. and you can label and set up your own folder hierarchy. Using an Ethernet cable connect the Melco's LAN input port to a free port on your Wireless router. Using a USB cable connect one of the Melco's USB outputs to a USB DAC such as those from Chord Electronics. Installing any general Control Point App (Lumin, Kinsky and many others)on an Ipad/Iphone/Android device enables music selection. A good USB cable should be used. The Melco will automatically handle the different sample rate ability of the DAC and you can configure to convert DSD data to PCM for DACs which do not handle DSD data. 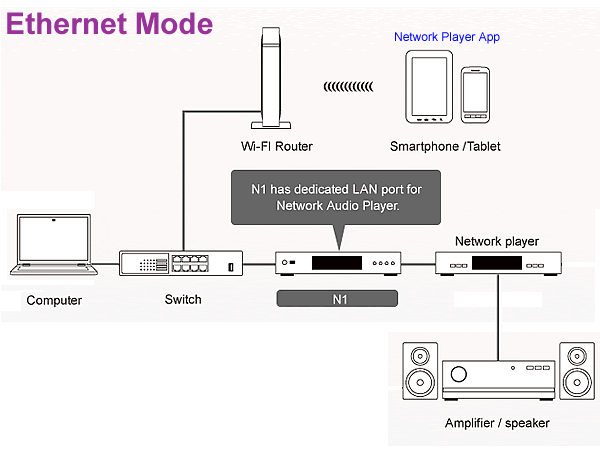 For network players, such as Simaudio's MiND, connect the Melco's LAN input port to a free port on your Wireless router and connect another Ethernet cable from the player port of the Melco to the Ethernet input on the network player. The network player's wireless iPad/Android App will see the Melco on the network as a music server. These Apps usually include Internet radio and sometimes also control input and volume functions for the system. A good short Ethernet cable (CAT 7 or CAT 8) between the Melco and the player will improve sound quality. 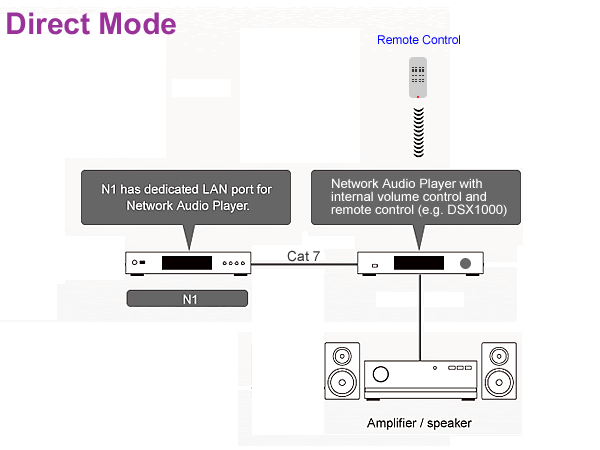 Finally the Melco can be used off the network entirely (no internet radio), and without control app, by connecting to a Network Player with internal volume control and remote control such as Chord's DSX1000. Using a CAT 7 or CAT 8 cable results in a fantastic sound. Using the Network Player's remote is just like operating a CD player and utterly reliable free from network glitches or app freezes. In this mode, adding new music to the Melco can be done simply by transferring from plug-in USB drives. No router in the room where your HiFi is located?. No Problem. Melco stands for Maki Engineering Laboratory Company and is a family business based in Japan where the product is manufactured. Makoto Maki, the founder, is an enthusiastic audiophile and had previously released a very high end turntable in the UK in 1980. Melco developed into the largest computer peripherals manufacturer in Japan, currently with fourteen global subsidiaries the largest of which is Buffalo Inc. Buffalo's USA division is located in Austin Texas. The Melco music library products are the result of a two year collaborative effort and included many highly respected audio industry experts. The Melco N1A and Melco N1ZH come with a two-year non-transferable limited warranty.